About a year ago, a friend and I were having a conversation about our intentions for the new year. My intention was to seek out and bring together the most nourishing oils I could find, in one bottle to create one effective fusion. Yes, I am aware that technically oils don't moisturize, but I specifically looked for plant oils that have moisturizing qualities. What I mean by moisturizing qualities is the ability to effectively lubricate the hair. I wanted the oil to not sit on the hair and weight it down, I wanted the blend to help the comb glide through the hair. I wanted instant shine, but not the "I got a bunch of oil in my hair" shine. After using the oil, I wanted my hair to be more lustrous and appear healthier overall. That was a year ago. Today I finally arrived at the place where my intention has now manifested. Ladies and gentlemen, I bring to you Gleau. 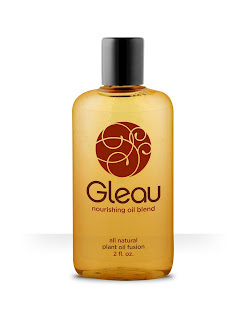 Gleau (pronounced glow) is a blend of 8 different oils each unique in their ability to impact the hair. Included among the oils is Moroccan Argan Oil, Camellia seed oil from Japan, sweet almond, two types of jojoba, two types of wheat germ, coconut and more. You Go Girl!! This is so exciting; I'm really proud of you for developing your hair product! I requested my free sample and can't wait to try it. Please keep doing what you are doing! Hey! I just received my sample in the mail. Thanks! What is the best way to use the oil? Great! I'm glad you received it. I use it pretty much every day when styling. I also use some at night before bed. I've had other people use it weekly after a wash. My friend in ATL uses it a couple times a week because her hair isn't as thick as mine. It's really up to you. I purposely made it a light oil that could be used frequently if needed. Hope you like it! I recieved my sample yesterday! I put a little bit on this morning, and so far, I love it. Its light, and it provides a really nice shine, and softness. I'll try it on my braidout when I wash tomorrow and update my review! Thank you, and I cant wait until this is available to buy. Hi Coco! Thanks for the update. I purposely "designed" this blend to be light. That way I can use it daily without heavy build up. My mother in law is a type 3 and her hair loves it. I've even given a sample to someone with a type 4 bleached natural hair. She even liked it. Shine and softness was my aim. Some products give you shine but not softness or vice versa. I'm glad you experienced both! I just received my sample today! Thank you! I look forward to trying it. When will the product be available for purchase? I just used my gleau sample last week after a relaxer. I used it to deep condition underneath organic root olive oil deep conditioner. A week later my hair still has so much sheen, and it didn't weigh my hair down as much as I feared. I'd love to add this product to my regimen, but for now I'm gathering coconut and avocado oil for moisturizing treatments. I just got my sample in the mail. Thanks for mailing to me. I didn't think you would because I'm in Jamaica. Now I'm excited to use it! Great La-Shaun. I hope you love it! I am so happy for the product launch. I have completely finished my sample. A little goes a long way. I absolutely love how it give shine and moisture without weighing down the hair. I can't wait to order my full size!! WOW!! AFTER ONE USE I AM HOOKED! WILL BE BACK FOR MORE...MEEOW!! Thank you for the sample! That was fast! I can't wait to try it!! !